While building up my Spoonflower shop, I’ve amassed a collection of 8″ square swatches to test my fabric designs. I also have a pretty big collection of tiny 5″ zippers that I ordered online in bulk back in the day when I was slightly addicted to making zipper pouches. 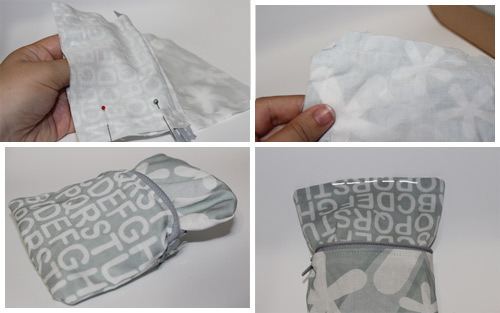 This tutorial will show you how to make a lined zipper pouch using two Spoonflower swatches and a 5″ zipper. If you don’t have Spoonflower swatches, you’ll need two pieces of coordinating fabric measuring 8″x5.5″. I actually don’t own a zipper foot (I sadly lost it while moving years ago and haven’t had a chance to replace it), so my zippers aren’t installed perfectly. If you have zipper foot, you can get much closer to the edge of your zipper and it will look better. 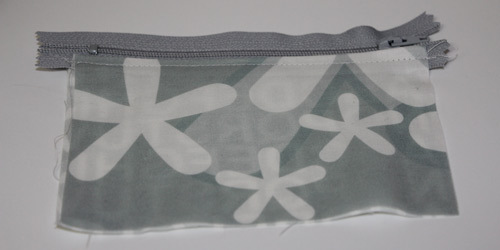 For this project, I used a 1/4″ seam foot instead of the zipper foot, which works well in a pinch. Be resourceful! 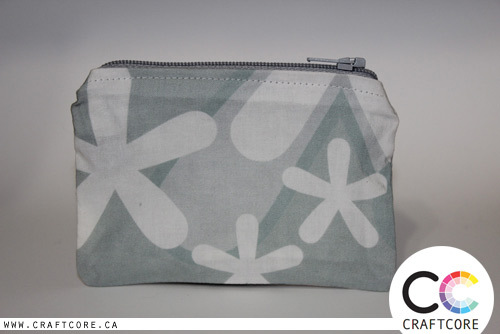 These pouches are tiny, just big enough to slide in a debit card and some change. They are super cute and make a great gift! If you want to make an alternate size, check out the Adapting the Tutorial section at the bottom of this post. 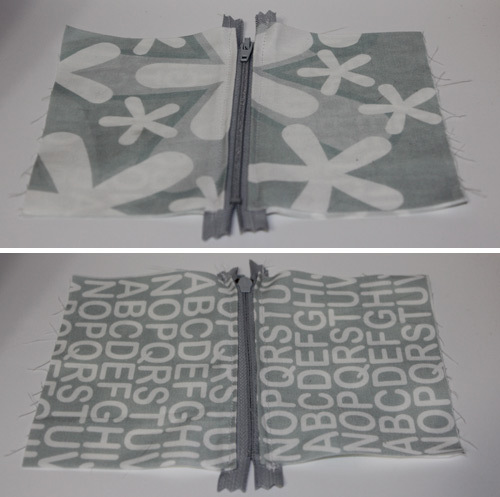 The material featured in this tutorial comes from my Typography fabric collection. 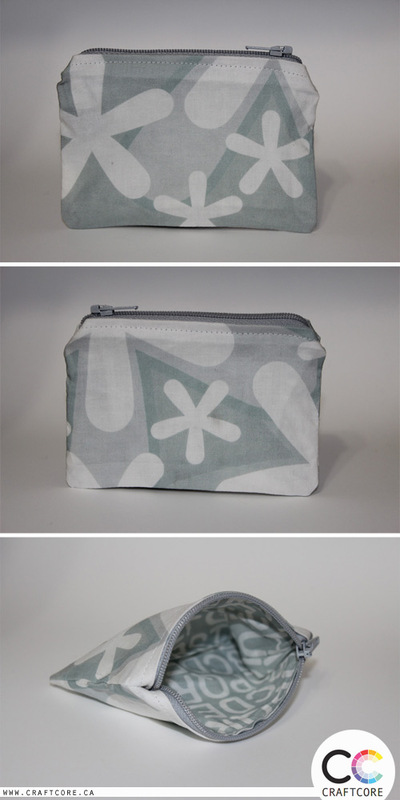 You can view and potentially purchase here at my Spoonflower shop if you are interested in supporting Craftcore. Thanks! 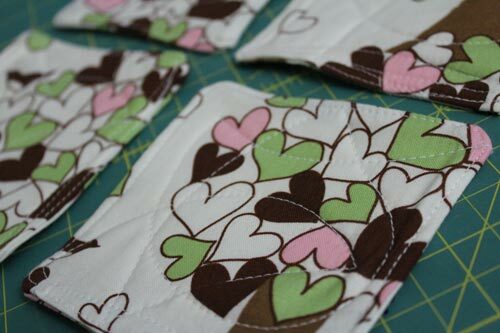 Lining Fabric: 2 pieces cut at 5.5″ wide by 4″ tall. 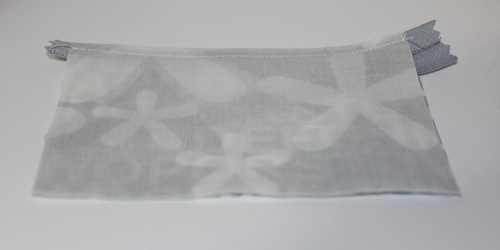 Outer Fabric: 2 pieces cut at 5.5″ wide by 4″ tall. Layer your fabric and 5″ zipper. Place your lining fabric face up. On top of this, place your zipper face up, lining the edge of the outer fabric with the top edge of the zipper. Layer your outer fabric face down, lining it up with that same edge. 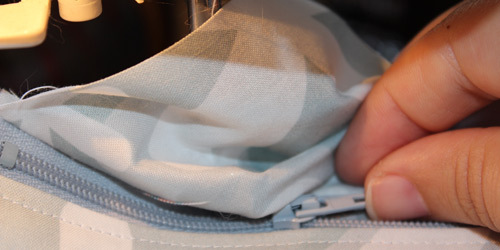 All fabrics should be centered so there is approximately 1/4″ of fabric beyond the working part of the zipper. Pin and sew as close to the teeth of the zipper as you can. If you have a zipper foot, use it. The trick to sewing the zipper is to start with the zipper done up. Sew about half way down the fabric, then stop sewing while the needle is in the fabric. 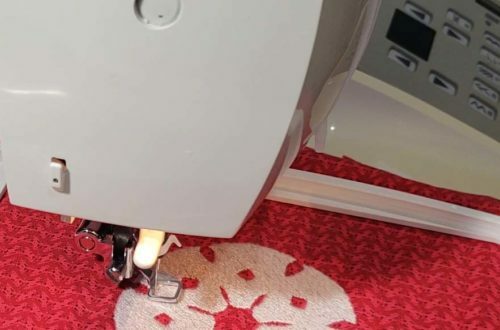 Lift up your foot then carefully open up the zipper and move the zipper pull to an area you have already finished sewing. Put the foot back into its starting position and continue until you reach the edge of the fabric. 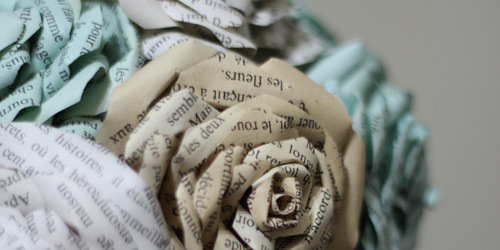 When you are done sewing, you’ll have something like this when you open it up. 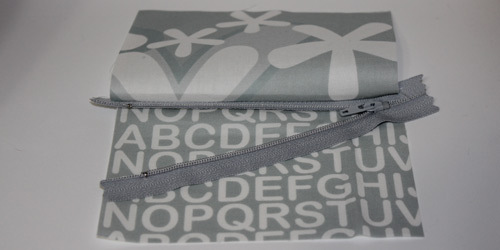 The floral print is my outer fabric, the alphabet print is the lining fabric. 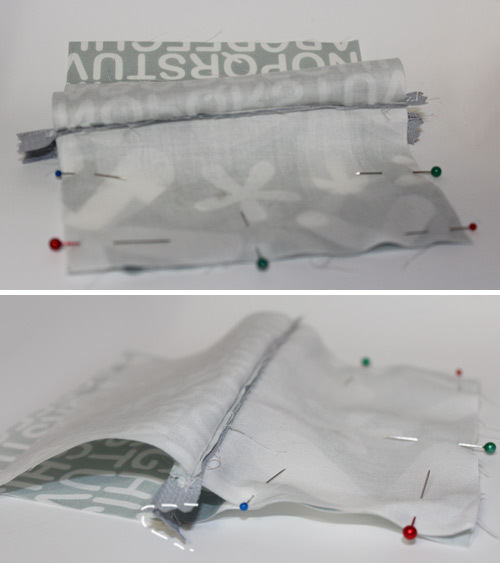 Press the layers together neatly with an iron, then sew a line of top stitching to hold in place. Use the zipper pull technique again to get the lumpy pull out of the way of your needle. Now repeat on the opposite edge of the zipper with your two remaining pieces of fabric. Progress shot: here is the bottom side pressed and ready to go, while the top side is ready to be pressed and top stitched. 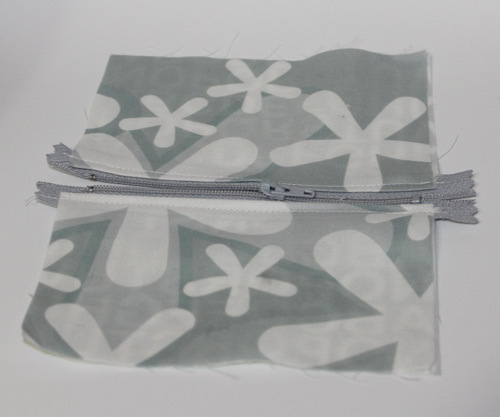 Once you have sewn both sides and pressed to your liking, open up your zipper so that the zipper is in the middle. This is very important otherwise you won’t be able to get your layers in the right position at the end! Bring the two outer fabrics together and move the zipper so that zipper forms a “V” shape. The point of the “V” should be facing the lining fabric. It’s difficult to explain, so check out the photograph below where I’ve drawn the “V.” Make sure that the two lining pieces are moved up and out of the way. Pin the fabric in place. Sew along the “U” shape indicated below, starting and stopping as close to the teeth of the zipper as you can manage without going over them. This should align with the stitching visible along the edge of the zipper. Now it’s time to repeating for the lining side. 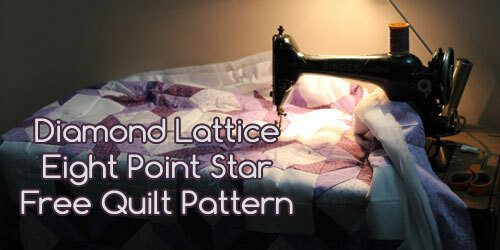 The process is similar, except that you need to leave a hole in the middle of your lining. Pin strategically as outlined in the picture below. Leave approximately a 2″ gap. 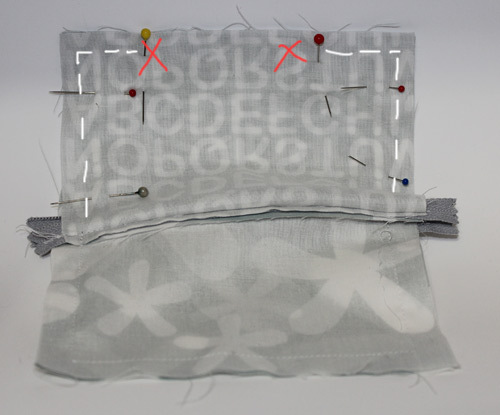 Sew along the dotted lines indicated below using a 1/2″ seam allowance, but make sure to stop, backstitch, then start again at the two X marks. I like to trim the seam allowance off the corners to help reduce bulk. Snip snip! Pull the outer fabric through the hole and turn everything right-side out. This is where that partially open zipper from step 6 comes into play. Open it the rest of the way to help widen the gap. 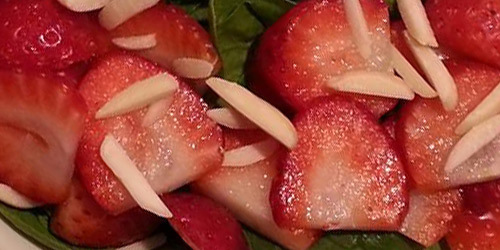 Carefully pull out the corners until you’re happy with their pointy-ness. All that is needed to be done is sew the hole in the lining shut as close to the edge as possible, then stuff the lining back inside. 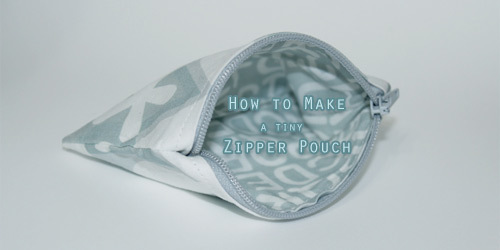 Although this tutorial makes a tiny and adorable zipper pouch, you can easily adapt this for any size you desire. The width measurement relies on the width of the working part of your zipper. Ignore the length of selvage beyond the two metal clasps. 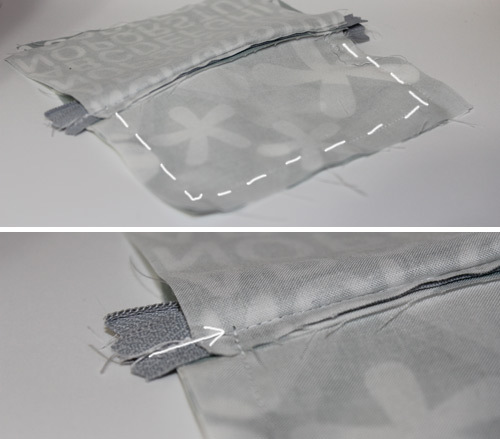 Take the measurement of this working part of the zipper and add 1/2″. IE, if your zipper is 8″, you want to cut the fabric pieces at 8.5″ widths. For the length, this is really up to you! 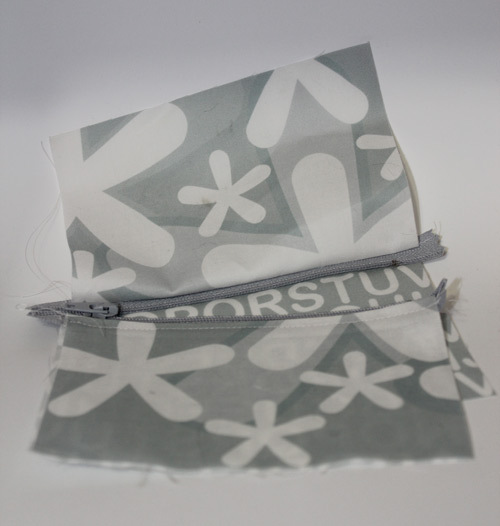 You could make a square pouch, a short and squat pouch, or even a long skinny pouch. The choices are endless! If you end up making a pouch from this tutorial, please share a link to your project in the comments! I love seeing the results! This is just the method I’ve been using, so there’s probably ways to improve on the technique. Feel free to share tips and tricks in the comments as well!